Yeah, I know those words get eyes rolling for anyone under the age of, well, mine I guess, yet when applied to rugby in particular they can't be ignored. Before the union code went pro, the 'season' was only really starting now in mid to late January. In fact, many still only pay attention when the Six Nations is on - you and I know that's their loss, of course. When it comes to this current campaign, I've been harping on it since late July when the first pictures of preseason training were being posted on the Leinster website. Then we had the Women's Rugby World Cup to get us through August before the new-look Guinness Pro 14 kicked off in September. In that time we rugby nerds have gotten used to a steady diet of big matches every weekend until the one just gone, when provincial fans had a spot of 'cold turkey' with none of our favourite teams in action. In recent years the interest in the Women's and Under 20's versions has grown steadily, with TV coverage generally doing likewise. It's a shame they have to be staged parallel to the men's tournament as that surely must have an adverse affect on attendances, but i'm assuming that travel costs also need to be factored in. Although the WRWC2017 was a disappointment on the pitch for Ireland, having it staged here was a massive deal for the women's game here, and with participation levels ever on the rise that can only mean good things for our chances of success down the road. I know there has been much controversy off the pitch but hopefully we'll be able to find the right levels to give the squad every opportunity. The girls kickoff in Toulouse on Saturday night and we wish the new coach/captain combo of Adam Griggs and Ciara Griffin all the best. It might be time to put the term 'Wolfpuppies' to bed as I don't see it being used much anymore...but whatever we call them, the Under 20 comp never fails to give us a taste of what's coming next along the Irish assembly line. Captaining Ireland this time around is Leinster's Tommy O'Brien, who impressed on the wing last year but moves into the centre for 2018. Their first outing is in Bordeaux on Friday evening. Of course the Six Nations is a major trophy in itself but we all know Joe Schmidt and co will also be using these matches to help prepare for the World Cup in Japan. Meanwhile there will be nations aiming to qualify for the tournament, and there are a couple of spots in Ireland's pool still to be decided. The 'lower tier Six Nations' is now known as the Rugby Europe Championship and the results of this year's tournament will be added to 2017 to decide qualification, with Georgia already qualified and Romania in pole position to join them. Also there's the second leg of the Americas playoff between Uruguay and Canada next weekend, with 'Los Teros' having surprisingly built a lead in Vancouver. These matches tend to be streamed live on the World Rugby site. We'd be forgiven as Leinster fans to bask in the glory of our perfect record from that tough European pool, but not only has the Saracens quarterfinal pairing brought us back to reality, we can't afford to take our eyes off the Pro14 either. The shortened regular season means we've just eight matches left with half of them falling in the Six Nations window. I'm sure Embra and the Southern Kings will offer their own challenges but the biggest tests will surely come in our two clashes with the reigning champion Scarlets, who also happen to stand in our way to top spot in Conference B.
Lansdowne with their perfect record are miles ahead atop Division 1A but with a playoff system in place they'll want to stay sharp and there are several in contention to join them in the top four. One key element of club rugby during the Six Nations is that if watching the test matches over a 'few jars' is your thing, you'd be helping your local club out a lot by choosing to watch in their bar, with the added bonus of being surrounded by fellow rugby fans to cheer on the boys in green with you. 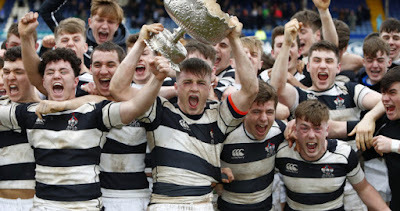 On Tuesday I'll be heading to Donnybrook for Blackrock v Castleknock, and I can't wait - schools rugby is awesome. Tactically they're not a million miles off of Pro14 standard and the atmosphere is always 'Rocking' [pun intended, though of course all schools know how to bring the noise]. 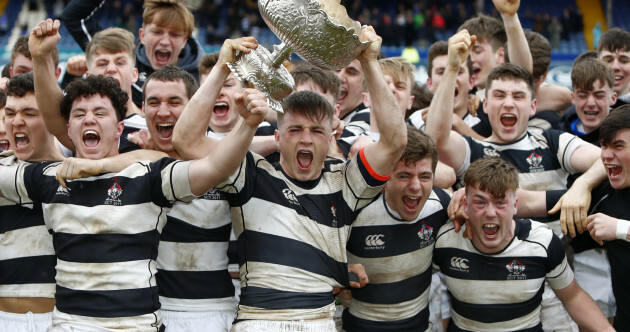 Belvo are already in the quarters as they bid for a 'three-peat' but they only just edged out Gonzaga on Sunday which shows how tight this competition can be. If you can't make it to a match yourself, eir Sport has you covered with a lot of live action from Leinster and Munster. This year's southern hemisphere bonanza kicks off on February 17 minus a few teams...we know what happened to the Cheetahs and Kings and sadly the Western Force are no more, for now anyway. When there are massive Six Nations clashes of a Saturday, there's no better way to get in the mood than to catch a Super Rugby clash or two that morning, and if you happen to like dodgy defending high scoring, it rarely disappoints. Getting more and more relevant each passing year for Irish fans as both our men's and women's teams continue to climb through the ranks and they also have the World Cup to look forward to in the summer. During the Six Nations there are World Series events in Hamilton, Las Vegas and Vancouver. I add these because they are also on over the coming weeks...even I have to let something go during Six Nations and these are definitely the leading candidates. I've nothing against rugby league per se but I'd always watch the fifteen man code first when they clash. As for the Anglo-Welsh, well, meh.